Sit on top kayaks are a cheap and easy way to get out on the water. Sit on top kayaks allow anyone to get out on the water and give kayaking a go. They can also be considerably cheaper than traditional kayaks and canoes, and are easier to store and transport. 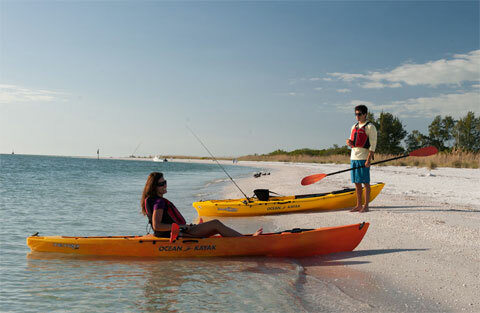 We would recommend that you get some basic kayak training from a local club. Once you understand the basic paddle strokes and the importance of body position, you will enjoy your sit on top kayak much more – and you will use less effort to go much further. As with all paddle sports, always wear a buoyancy aid when you are on the water. Sit on top kayaks are very stable but if you do fall in the water, a buoyancy aid will help you get back on your sit on top kayak much quicker. Sit on top kayaks are available from most canoe shops, where staff will also be able to give you good advice on buoyancy aids, paddles and other kit, and can answer any questions you may have. Sit on top kayaks are suited to calm, sheltered water and UK summers. Public race events which include an element of kayaking often use sit on top kayaks as they are simpler and safer to use for those who have no previous kayak training. Image courtesy of Ocean Kayaks. Photograph by Sam Root.